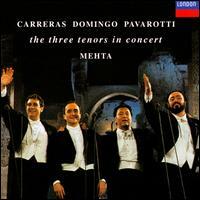 Agustín Lara; Eduardo di Capua; Ernesto de Curtis; Francesco Cilèa; Franz Lehár; Giacomo Meyerbeer; Giacomo Puccini;... New. SIGNED IN PERSON BY PLACIDO DOMINGO at an event held at the Met Opera Shop in NYC! Event photos are included. Brand new, never played, gift quality. Expedited shipping is welcome. Signed by author.